John Thorne once accused zucchini of having "the nutritional value, flavor and texture of rained-on newspaper" and of being able to claim the dubious virtue of being growable by anyone, in overwhelming abundance. Harsh words for such an innocent little squash, and in my opinion, totally unwarranted. After all, "watery" is just a disparaging term for "juicy" and sure, its flavor may not be particularly assertive, but that adds to its versatility. As for the nutritional value, I stand by my own completely unfounded idea that anything grown out of the ground and messed around with only a little, has to be good for you. Of course, I haven't met a vegetable that doesn't profit from a little stuffing. Especially stuffing with a mixture of almonds, breadcrumbs, lemon, garlic and mint. Plus, they're so darn cute, splitting down the middle like little baskets just trying to hold in all of that stuff. I made a few alterations to the recipe, as tends to happen. For one thing, I left out the 1 tablespoon of sesame seeds called for in the pesto because I didn't have any. Out of guilt, and to make up for it, I anointed them with grated parmesan cheese and quickly ran them under the broiler at the end. You know, for crispiness and meltiness and such. I would also recommend adding a little salt and pepper to the pesto mixture before braising. But after those changes, you're all set to go. In a food processor, chop the first 6 ingredients until coarse. Add the oil and the salt and pepper to taste, and pulse a couple of times until you get the consistency of a chunky pesto. Cut an X into each wheel, to within about 1/2 inch of the bottom. Be careful not to cut straight through. Pry the wheels apart, and scoop about 1 teaspoon of pesto into each. Arrange the wheels in a 10" oven-proof skillet, and add 1 cup of water to the bottom of the pan. Bring the liquid to a simmer over medium heat, then cover and cook for 20 minutes. The zucchini should be tender. Preheat the broiler. 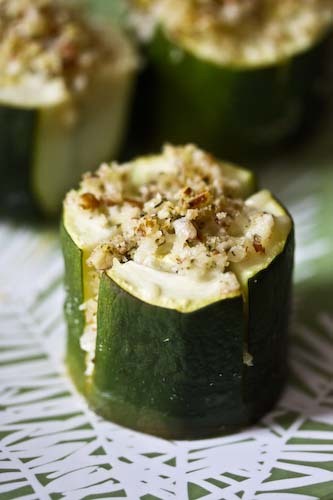 Remove the zucchini from the heat and sprinkle with the parmesan cheese. Run the pan under the broiler for 3-5 minutes until the cheese is melted. Serve. This stuffing sounds wonderful! I stuffed mine with fresh mozzarella and popped it in the oven. It was good!